I hate to iron. For many years I refused to buy clothes that had even the remote possibility of wrinkling. Then I married an Army guy. Ironing became a way of life with those uniforms! 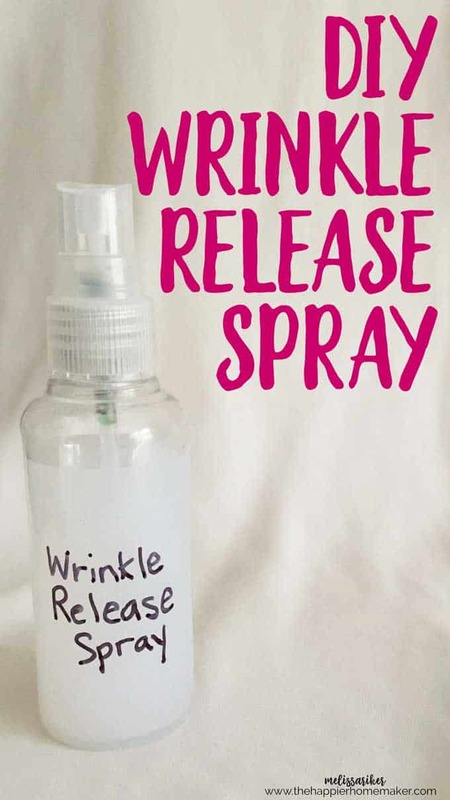 Nowadays I still try to avoid buying high maintenance fabrics but when I do find myself encountering wrinkles I usually turn to my DIY Wrinkle Release Spray rather than an iron-it can work wonders! Mix all ingredients in a small spray bottle that has a mist setting. To use, mist clothes lightly with spray and smooth with your hands. A few notes-using the bottled water is a precaution in case your tap water has a high mineral content or anything that could discolor your clothing. The rubbing alcohol is optional, it helps the spray evaporate a bit faster, it’s fine to leave it out if you prefer. I keep one little bottle of this in the laundry room and I keep one in my travel toiletries bag to use when we’re on vacation. It can also serve as a room air freshener in a pinch too! Are you like me and avoid wrinkle-prone fabrics? Let me know in the comments! This is worth a try………….thanks for sharing ! I’ll definitely try this out, it’d be great to rid myself of ironing, it’s such a chore. Will let out know how I make out. I will try this for special things.BUT I love to iron,and this will just make it better.. My sister use to tell me I am crazy for enjoying ironing,,,LOL thank you for all your tips…. I hate ironing and actually threw away the board! !